Make packing school lunch easy and serve your kids something delicious with this vegetarian, nut-free, and gluten-free Lentil Chickpea Vegetable Salad. Packing lunch for the kids every single day is not easy. I think most parents would agree it’s a chore they can’t wait to stop doing once their children are old enough to make their own lunch or buy it at school. I’m not going to sit here and tell you that packing my girls’ lunch is my favorite part of being a mom, but I also don’t mind it as much as many of my friends. You see, packing their mid-day meal gives me the insurance that they are eating a healthy and delicious lunch, allows me to show them how much I love them by making one of their favorite recipes or adding a note to their lunchbox, and provides me with an opportunity to be creative in the kitchen as I seek to keep their lunch interesting and avoid their boredom from the same lunch meals week after week. One of the challenges I am faced with when packing my girls’ lunchboxes is that they go to a Jewish and kosher pre-school, and as such they can only bring vegetarian or fish-based meals – no meat allowed. On top of that restriction, their school is a nut-free establishment. There are so many days I wish I could send leftover chicken from last night’s dinner or peanut soba noodles, which they love. But alas, I can’t, and so I head to the kitchen with my thinking cap on to keep things interesting for them at lunchtime. 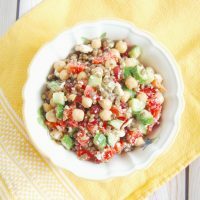 Some of their favorite lunchboxes consist of these Quick, Easy, & Healthy School Lunch Ideas, like Easy Veggie Egg Muffins, Veggie & Bean Quinoa Bites, soynut butter and fruit sandwich kebabs, cucumber and cheese “sandwiches,” smoked salmon and cucumber roll-ups (one of their all-time faves), and this Lentil Chickpea Vegetable Salad. This salad came about the way many of the lunchboxes I put together do – from ingredients I have on hand. I always have a package of Trader Joe’s steamed ready-to-eat lentils in my freezer, and one night after making my Vegetarian Lentil Bolognese I had about a cup of lentils left over and decided I would use them for the next day’s lunch. I peeked into my fridge to see what else I could add and found some staples – colorful bell peppers, Persian cucumbers, and feta cheese. I also had pomegranates, which my girls absolutely love, so I decided to throw them into the salad too. 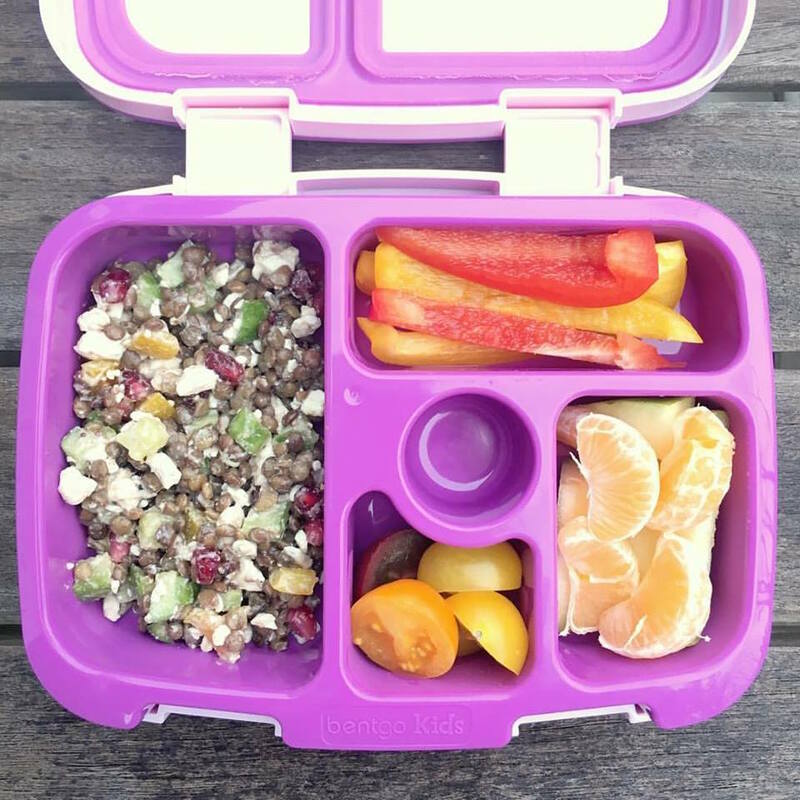 The next morning when I posted their lunchbox on my Instagram account, I had such an overwhelming response from people who loved the look of the lentil salad and asked for the recipe. Then the girls came home with empty lunchboxes and I knew I had a winner and had to make it again. The next time around I had half a can of chickpeas in my fridge, so I decided to add those in for the added protein and fiber boost. The salad is topped with a lemony mustard maple dressing that’s bright, fresh, and subtly sweet. I always make enough of it to have some for my lunch too and I throw it over a bed of arugula or mixed greens to bulk it up and make it a more filling meal. This Lentil Chickpea Vegetable Salad with Feta fits the bill perfectly for my girls’ school – it’s vegetarian (vegan if you don’t add the cheese) and nut-free. It’s also gluten-free and egg-free for those who are looking for that in their lunch recipes. I would even recommend it as a side dish next to a piece of chicken or fish at dinner. As always, you can change up the recipe to make it your own – add different veggies, make it without cheese or choose a different cheese, and when pomegranates aren’t in season (like now! ), add diced strawberries, halved blueberries, or even chopped apples. So many possibilities and so so easy! 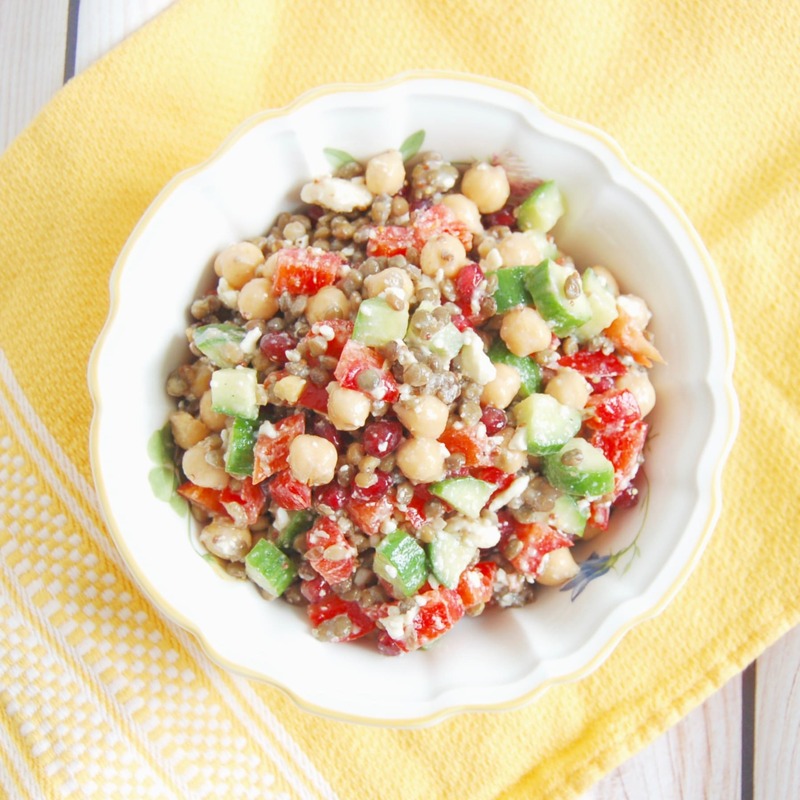 Protein- and fiber-rich lentils and chickpeas, crunchy bell peppers and Persian cucumbers, sweet pomegranate seeds, and salty feta cheese are tossed together in a lemony maple-mustard vinaigrette for a kid-friendly and adult approved lunchbox salad. Add some arugula or mixed greens for a more filling meal. 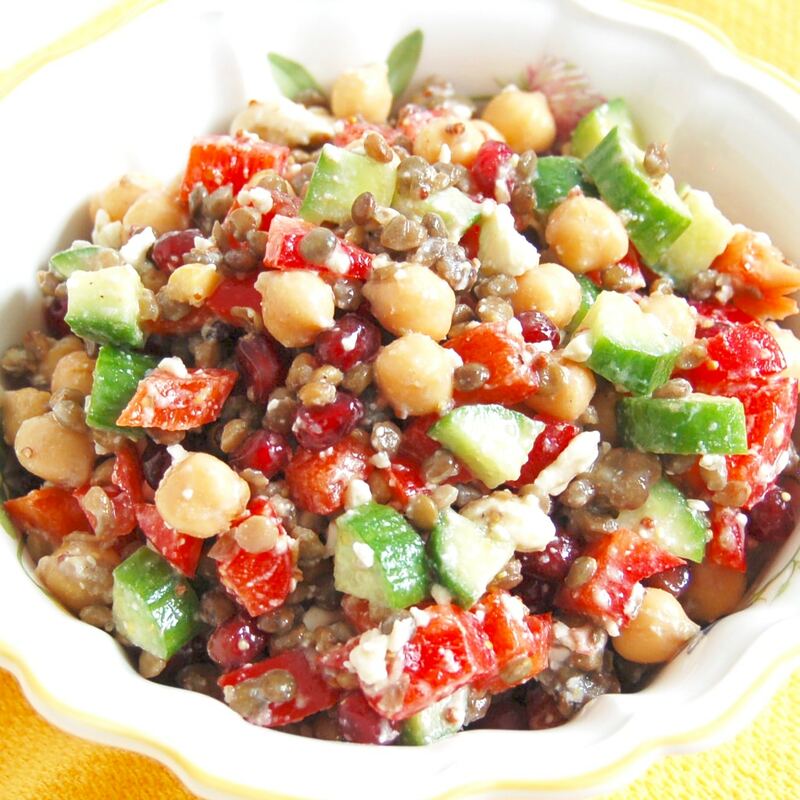 In a large bowl, combine lentils, chickpeas, peppers, cucumbers, feta, and pomegranate seeds. In a small bowl or mason jar, whisk together lemon juice, olive oil, mustard, syrup, salt, and pepper, to taste. Pour dressing over lentil chickpea vegetable salad and toss to combine. Serve over a bed of arugula or mixed greens if desired. Do you pack lunch for your kids? If so, do you enjoy it or find it a chore? I love that you put so much great thought into their lunch boxes! They’re so lucky to have a mom who cares so much about their health! This salad looks delicious! I think we would get along quite well at that school! 🙂 The nut-free is hard though. My son’s class is tree-nut free, but that just pertains to snacks. Since lunch is eaten in the lunchroom, not the classroom and there is a separate area for the allergy kids. I’m thankful I don’t have to do nut free for lunch as well since we eat a lot of them. This salad looks incredible. Totally something I would whip up for sure! yum! You definitely would Jenn! I’m happy that next year when they’re in Kindergarten they can bring nuts since we eat a lot of them too. I’ll still have to do meat-free, but I’ll have more options. Hope you give this salad a try – I think you’d really like it! Thanks so much Maria! haha…they have their fair share of treats too, but all in moderation 🙂 I’m proud of what good little eaters they are! This is definitely a great protein-filled packable option! I bet the flavors just improve as it chills, too. Thanks Alisa! And yes – the flavors meld as the vinaigrette soaks into the ingredients! Thanks Charlene! I hope you give it a try and enjoy! That is one scrumptious looking salad! And it’s full of nutrients, just what we want for our little ones! Thanks Sonali! Exactly! Hope Sienna likes it! Yay! So glad you like it Amanda! Thanks so much Lauren! It’s definitely a challenge to keep those lunch boxes packed with something new, interesting, and that the kids will like. I’m so glad that they enjoy these plant-based meals! Haha I love feta too! Thanks so much Lindsey! I love how versatile chickpeas are! I made this over the weekend (just skipped the pomegranate since I didn’t have any) and it was great! So do I! Thank you so much for letting me know and so glad you liked it! I made it for the girls for lunch today and added diced strawberries now that Pomegranate seeds are out of season! I love all the colors, flavors and textures in this salad! It’s seriously perfect! Delicious!! I think I get in a “salad rut” sometimes. This is inspiring! Glad you’re inspired by it Stacey. I agree – salads can get boring after a while. Definitely need to change things up! I love all of these ingredients. Such a refreshing, nourishing, and healthy salad to have all week. I’m sure that the longer you let these flavors sit, the better it gets. Thanks for sharing! Pinning for later! So glad you like the recipe and thanks for pinning! It definitely gets more flavorful as the ingredients sit and the flavors meld together. LOVE this! Especially the feta, such a nice addition. Chickpeas are such a versatile food! This salad looks yummy! I agree – and so are lentils! Thanks Kristina! This looks so tasty! I love that you added pomegranate seeds – I’m sure that adds a nice flavor profile. Thanks Christina! I always love sweet and savory combos! This looks great!! And the Vinaigrette sounds amazing!! Thanks so much Abbey! I hope you love it as much as we do! This is my kind of lunch for sure! I do still make my highschoolers lunch for him but he would never eat this! I think I’d like the control over their nutrition, too. But I’m amazed your pre-schoolers will eat this salad. Looks too healthy. 🙂 My toddlers will see the veggies and run. Such picky eaters. I’ll enjoy it myself then. Haha Chrissy, most of the kids in their school wouldn’t eat it either. I feel very lucky and am grateful that my girls enjoy this kind of food. I started them super early eating all these kinds of flavors and I think that has made all the difference. Although I know that doesn’t happen for everyone, so I don’t take it for granted. I hope you at least get to enjoy this delicious salad! Pinned. Can’t wait to try this recipe, Jessica. 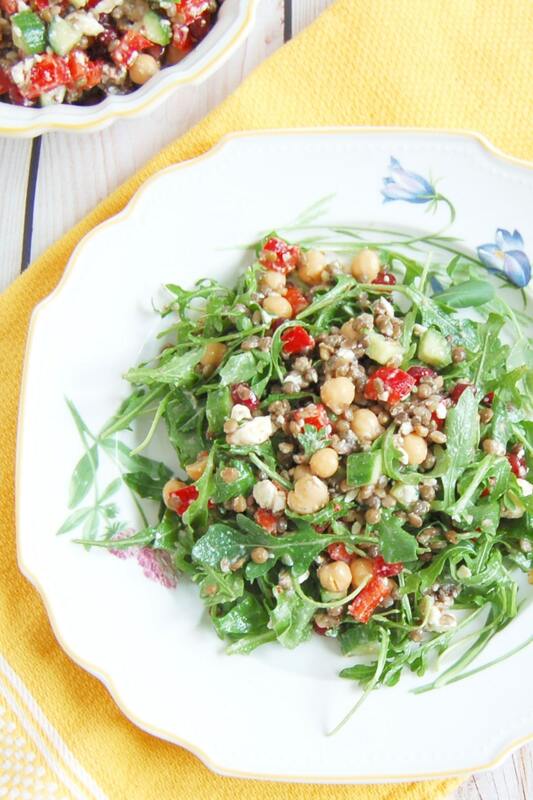 I love chickpeas, arugula, feta… so I’m sure I’ll love this one. I love the addition of the pom seeds in here- but so perfect that you also said you could make it seasonal too! I think your girls are so lucky to have this in their lunch- I know I would be! Thanks liz. The Pom seeds are a perfect compliment, but I made it with diced strawberries last week and it was a delicious combo too. Lmk if you give it a try! I am so jealous that your girls will eat this, so healthy and delicious! I’m so grateful they do! I definitely don’t take it for granted and hope it doesn’t change ???? I absolutely love this for a lunchbox idea! My daughter would really like this. Thanks so much! My girls love it – hope your daughter does too. Keep me posted! Forget the kids! I’m going to make this for myself and eat it every day for lunch 🙂 Seriously though, I saw your recipe on Pinterest the other day, and pinned it right away. I love all the ingredients in this, and pretty much have all of them on hand in my regular pantry rotation. How wonderful that your girls love it too! Haha…you totally should EA! I love it too. Thanks so much for sharing the recipe and can’t wait for you to try it! Wow, your daughters don’t know how lucky they are! Great recipe! Thanks so much Diane! I know they love their lunches and hopefully they appreciate it all! They rarely ask for what their friends are having, which at least is something!